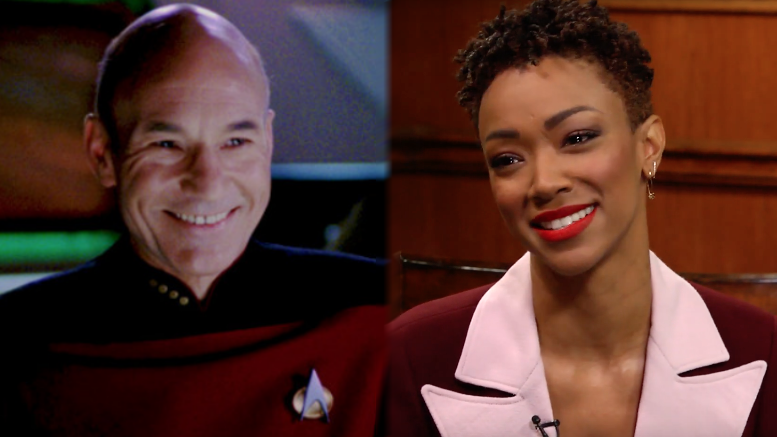 Sonequa Martin-Green sat down with legendary interviewer Larry King to talk Star Trek: Discovery and the expansion of the Star Trek television universe. She also talked about the upcoming Patrick Stewart vehicle, a new show about Jean-Luc Picard, and she may have spilled the beans as to the show’s as yet unannounced title. Keeping it simple for title of the Picard show? [Patrick Stewart] is helming his own Star Trek. It’s going to be called ‘Picard’… He announced his come back recently and it was – goodness – the response was amazing. People are really happy including me. Earlier in the interview, Martin-Green also noted: “he is doing ‘Picard'” when referencing Patrick Stewart’s return to the franchise. The new series has been referred to as the “Picard show”, “Picard series.” “Star Trek Picard” is not a totally new title, it seems to be the working title both executive producer Alex Kurtzman and the Hollywood trades have used more recently when referring to the show. This could be what Martin-Green is talking about, however, her additional comment about it being “called ‘Picard'” seems to be more specific. If true, it isn’t clear if the name would simply be Picard or Star Trek: Picard. If Picard is indeed the name of the new show, this reveal comes as a bit of a surprise, since Patrick Stewart said just two days ago that he is “banned” from exposing details of the show, including its title. Given the strong overlap between the creative teams of Picard and Discovery, it seems plausible that Martin-Green, who works closely with Discovery showrunners, would be privy to such information. Earlier in the interview, Martin-Green said “we were just talking” about the possible 3rd season of Discovery “last night,” so it is possible she has the most up to date info. For now, there is no official announcement from CBS regarding a title, so this should be taken with a grain of salt. I am very excited about it. I’m more excited than I thought it would ever be possible for me to be about going back into the world of Jean-Luc Picard. I know what our first season will be about and I know the storylines and so forth. We start shooting it in the middle of April sometime, in the middle of California. The new show will pick up the story of Jean-Luc Picard twenty years later, with the destruction of the planet Romulus in 2387 being an event central to the show’s story. Stewart has previously stated the show will feel like a 10-hour movie with a highly serialized story, and it will hopefully continue with the show being set up to run 3 seasons. I wouldn’t read too much into the geography part of the comment. A lot of people, sadly, have little clue about geography. And for many, California just means LA and nothing else. That very well could be the case for Stewart who is not a native and given the time he spends in LA could very well think of LA as the center of all things like many Los Angelinos do. Temecula Valley wineries stood in for the Picard estate in France at the end of TNG. It would figure that they would again as this show is set in his post-Starfleet years. But isnt la the main part of California? Just like new york city to new york state, or fir canada toronto is to Ontario. There are the big cities and the rest is just filled. In fact Canada is just Vancouver toronto and Montreal the rest is just filler and snow. If you ask someone from LA the answer would be yes. (They tend to think very highly of themselves) But the honest answer is absolutely not. The geographic “middle” of California is near a place called North Fork some 50 miles north of Fresno. LA is the largest metropolis and 2nd in the nation but the Bay Area 6th in the country. Similar to how Texas as two major metropolis’ in the top 5. How can one be more dominant than the other at that size? Not like New York where you have NYC and then the next largest metropolis is Buffalo. #50 in the nation. So it can be genuinely said in that case that NYC is the most influential part of the State in that case. In all seriousness ‘middle California’ is just central California and L.A. is nowhere close to that. If anything its famous for being part of Southern California or SoCal as we like to call it. I have no idea how Stewart would get that confused considering he lived here for a long time when he was making the show but the guy is also just speaking off the cuff and just made a mistake. Not a biggie. I lived in the OC for 10 years and I think very highly of myself. No. Los Angeles and San Francisco are the major urban areas of the state, but San Diego and San Jose both have bigger populations then San Francisco. Fresno, Long Beach and the capital, Sacramento all are around the half million mark. Fourteen cities have populations north of a quarter million. The economy varies depending on where you live, but the state is hardly a wasteland outside of LA and SF. Still the sixth biggest economy on the planet. It’s extremely silly to talk about the population of San Francisco proper, rather than the Bay Area as a whole. That is like talking about the population of Manhattan only, and not NYC as a whole or the greater NY metropolitan area. Picard: A Star Trek Story. Hahahaha! I know people will groan, but I like it. Everybody calls it the Picard Show. Maybe she just picked up the name somewhere. BEcause – WOULD she know the title if it’s being kept under wraps? The production is in California, so it’S not like she can accidentialy walk into a super secret meeting or onto the wrong stage, right? Shooting on Discovery has been over since before Christmas, I think. Sonequa doesn’t live in Toronto permanently. She met with the Discovery showrunners who also happen to work on the Picard show. So yes, it’s possible that she knows the title. She would know. I like Sonequa but she does tend to “insert” herself into stuff. So, I believe this is 100% accurate. I also like Sonequa, but I too notice that she sometimes tends to insert herself into things. Unlike Mulgrew and Shatner people actually like being around her. So does Simon Pegg. I’m amazed at how many people took what he was saying about the now dead ST 14 as gospel, when it was pretty obvious to those who were paying attention that he was just making s**t up. I don’t think Pegg was making it up though, they WERE moving towards another film even hiring a director. What he said was probably true at the time, even if maybe exaggerated but clearly they intended to make another film. It just broke down once they couldn’t get the two Chris on board. @ Tiger2. Okay, prone to gross exaggerations and flights of fancy, then. Oh, and they still intend to make another film. When, where, and how is anyone’s guess at this point. There just hasn’t been anything actual going on that lent itself to the irrational exuberance Mr. Pegg had on full display last year. It doesn’t mean she wouldn’t know though. Keeping it under wraps probably means in term of the public, people involved in the shows themselves could know it. That said I hope that’s not the title and she was just speaking in general. I guess she probably heard if from Alex? That would be the common connection, right? Yeah knowing the name of the show probably isn’t classified or anything, I’m guessing a lot could know it or Kurtzman just told them. Of course if he did he’s probably regretting it now lol. She’s the main star of Discovery. She’s knows everything. The full title is: Picard, The Frenchman Who Sounds Like A Brit. They used “Federation Standard” in the English version. It’s not just the dub. Well they reffered to englisch when in the german dub they used federation standard. This came to my ears too. Wondered what this is. Not the most compelling title (and a little self-reverential if you ask me), if true. It’s about as lazy as it gets. But so be it. I’m in no matter what it’s called. I kinda get the feeling that if it is called Picard then it will not have Star Trek in the title. Just like Enterprise in the first two seasons. I was hoping for STAR TREK: THE LAST GENERATION. Would also accept STAR TREK: STARGAZER. Well, Star Trek TNG 2.0 would sound a contemporary. …The Picard who fought at Trafalgar, the Picard who settled the first Martian colony…the Picard who got his own TV series. I’ve lived in California my entire life and “Middle California” is not a term I hear. I live on the Central Coast in Monterey, two hours south of the San Francisco Bay Area and it is considered Central California, though I usually think Fresno or Sacramento are “Central California” or when thinking about the geographic middle of the state. It seems like Patrick Stewart has worked in California long enough to say “Southern California” if the new show films in the LA area. Well, Fresno and the communities along SR99 would be the Central Valley, but yeah, been here my entire life and ‘Middle California’ is new to me. Damn Brits…. I like to think of the Bay Area-Sacramento-Yosemite area as “middle” California if you want to use that term instead of “central”. Everything north of Sacramento I think of as NorCal. Most refer to SLO-Santa Cruz as the “Central Coast”. I have uncovered that such designations depend greatly on what part of CA one calls home. The dividing line between north and south CA is further south among people from the LA area while it is further north among people from the Bay Area/Sac. SF Bay Area is surely considered Northern California. Term is widely used in media of the area. Yep, Northern California is basically the Bay Area and up. As someone who lived in both San Francisco and L.A. I can certainly tell you people think of S.F. as Northern California as people who live in L.A. as part of Southern California. It’s basically part of each cities DNA and how they are described in the media and culture. It is the commonly used term. But if you look at how much California still lies north of the Bay Area then Central CA would be the more appropriate term. Although admittedly if one were to divide the state in half that dividing line would begin on the coast somewhere very close to Santa Cruz. Technically putting San Jose and the Bay Area in the extreme southern end of the northern half. So there is that. This is actually what I’ve been figuring it would be. Keep it simple. Can we call it Star Track? That way my uncle will finally be able to say it right. Ha! And most every woman I’ve known all my life. Thanks, ambassador. And if they ever do a scene between Sarek and an Earth diplomat, I hope the model the latter on you. Not to me. That’s very pedestrian, in my opinion. As a long time Californian (I left. It got too crazy and populated and too expensive and hyper-liberal for my middle american tastes) I can say with certinity that people in LA consiter LA and surrounding areas the only legit part of California. If they say Middle of CA they mean LA. Unless they are filming a scene at a winery in middle geographically (Temecula is a LOT more populated than 1994 and wont look the same) then maybe. But all sound stages will be LA based. Actors and hollywood type are far too into themselves and being a part of the Scene to spend any amount of time in a hole relative to LA like Fresno. Haha, there are 8 million people in San Fran Bay Area. There are over 3 million people in San Diego County. Too legit 2 quit. I hope it’s called The Picard Show, and it ends up being a Comedians In Cars Getting Coffee kind of thing. And Aldeberon whiskey and Saurian Brandy. I’d pay real money to be as active and relevant and mentally acute as Patrick Stewart is when I’m 78. I hope they get a better title for it. I am more excited for this show than anything else coming out, including movies. To FINALLY have a story take place in the Star Trek universe that is not a prequel and continues the story of the Federation into an UNKNOWN fate is exciting for me. That, and Captain Picard is one my favorite characters of all time just hits me in all the feels. BTW: I just watched All Good Things and it is interesting that the future part of that episode takes place 25 years in the future, which would match up to real time for the actors. I wonder if the Picard show will use of that episode’s storylines for the characters. Oh, and yes the Picard title is perfect. I got the impression that by his telling the crew of his experience, he changed that potential future. We saw the 1701-D get destroyed in Generations, Riker and Troi got married in Nemesis and Data bought it (B4 notwithstanding). So I would expect a pretty different state of affairs from AGT. Right with you on the moving forward in the timeline, VZX, finally. Enough prequels. Thrilled about this. It’s “Picard” but pronounced “Pick-erd” like the old lady said it in the Time’s Arrow Season 5 finale. Gene Luck Pick erd, you say? Btw there… are… four… lights!!! With the famous intro from Buck Rogers. We will see how Picard is thrown from his century into the 25th century. Hanging out in the wilderness of Santa Barbara…. I work in Santa Barbara….I’ll indeed welcome him and the crew! If one chose to evenly divide the state into 3rds… Southern CA would run from Mexico to a line approximately just north of San Luis Obispo, north of Bakersfield and into Death Valley NP. Central CA would be from that point that runs from the coast somewhere between Sea Ranch and Timber Cove, some 20 miles or so north of Sacramento towards about the Donner Pass. And of course, Northern CA would be everything north of that. I wonder how long they’ll play this “we’re not telling you the show’s name” game. Everybody’s calling it Picard or “the Picard Show” anyway; if it’s called “Picard” or “Star Trek: Picard” they may as well announce/confirm that. If it’s something else, like the rumored “Star Trek: Reliant” or Star Trek: Destiny,” why not get the name out so people start associating it with Picard? The show hasn’t even started production yet. For the vast majority of people out there, this won’t even be on their radars until they see the first trailer for the show. We have to remember we live in the bubble, we consume this stuff like crazy. But what’s funny is all these clips I been seeing Stewart going on the talk shows lately many didn’t seem to know he was even going back to Star Trek. They heard about it, but they talk about it like its a rumor when it was officially announced months ago. And looking at that clip with SMG and Larry King he didn’t even know anything about it either. So for the average person its not going to matter much now anyway. My guess is they are waiting to create a big media event to introduce the show properly with both the title and its premise. IF they do it like they did with Discovery I’m guessing we will probably hear it before it starts production at least (Star Wars fans are still waiting to hear the title of Episode 9 and probably won’t get the title for a few more months after the film is shot like they did with TLJ). But they may wait until they start casting to announce something, which sounds soon if they start shooting in two months. So hang tight, we could hear it by next month. Really? That is the Top Secret title?? If true, which I doubt, that is a little underwhelming. Maybe “the middle of California” will be wine country (Napa/Sonoma) where, during the opening scene, Picard is visited by Geordi, who serenades him with a stream of technobabble while he tends to his vineyards. Brilliant! I love how many on this forum just love Picard and TNG, and reminisce of all the classic TNG scenes. Who is playing his dog? Breed? C’mon… details, people. Archer had one, and so should Golden Years Picard. I think it would be cool if the new Patrick Stewart series was called “Star Trek: Phlox”. Whatever they call the show, I’m still just super excited about the whole thing! I miss Picard (and TNG in general) sooooo much. I can’t wait until we finally get back in that era again. It’s still shocking to know we are finally heading post Voyager after a decade and a half of prequels and reboots. And if the Picard show is a big hit then we will probably be in that era for years to come when that show leaves the air! And I don’t see how it won’t be bigger than Discovery at least since that show is still pretty divided although its actually starting to feel more like TNG in tone and story at least. And while Discovery is improving for me as well, its just not going to be the same level as something like this. You’re not going beat a living icon coming back to the franchise and back in an era a huge chuck of the fanbase has missed for over a decade now. But I am happy that show is improving at least but with the Picard show I have not been this excited for a Trek project in twenty years. Production starts in just two months and I.can’t.wait!!!!!!! The Picard show is leading by nearly 80% and the others are not even in the double digits yet. The Section 31 show is around 5% lol. I’m really starting to wonder if that show is a good idea to go with knowing how fickle Trek fans are? But with the Picard show, that’s probably the biggest no brainer since announcing the new Game of Thrones show. Never heard of straw poll. Is that “a thing”? The sample size is pretty small (216 total votes as of this moment). Probably not very representative. Then again, I’m not surprised that many people probably look forward more to the Picard show than the other announced shows. It does bring back a very popular character so it feels less unknown than the other shows. Anyone can make one and voting is ongoing. It was only made a few hours old when I posted it. This one came from Reddit where people voted on it. But obviously its not a shock. Its the only show that has received wide praise from the fanbase in general. Its only making the point how much more people are excited about that show vs the others. A Section 31 show is very divisive as we all know and doesn’t feel very Star Treky. The other two might be great but cartoons will never bring excitement like a live action show would. But Picard is probably the anticipated for a lot of reasons, the biggest because it stars Picard. To be honest, I would have been surprised if that poll was below 80% for the Picard show. What it has going for it is a known commodity and name recognition. It’s the same reason a celebrity running for nearly any kind of public office will have an instant advantage over nearly any standard politician. It is below 77% right now for the Picard show. Problem with these small sample sizes is it’s very easy to manipulate the results. LOL its still 77%. That’s ridiculously high. Just for comparison, the second highest is Lower Decks with 6% so far. And its just for fun. Why would you need to ‘manipulate’ the results?? All these shows are coming regardless (S31 isn’t officially approved yet but it sounds like its happening barring some big factor) so it doesn’t matter, right? The only point that was being made was that the Picard show is the sure bet out of the others. They can all be great shows and the Picard show can obviously be bad. But if you had to bet money which one you think had the best chance of succeeding, its really a no-brainer it would be that one at the moment: Bringing back an iconic Trek actor to the fold; a sequel to probably the most popular Trek show today and the first show to go forward again since Voyager ended in 2001. Any one of those alone would be pretty popular for a big part of the base. To have all three in one show is even bigger. The other shows are more cautious because they are not traditional Star Trek shows which can either be a good or bad thing. I have said I have no problem with a S31 show but I’m still skeptical if its a good idea to make because people are very divided over the concept of S31 in general (as this board proves lol). Its one thing to have them pop up in 1 or 2 episodes a season. It’s another to be a full on show with the name Star Trek in the title. Even if the Picard show wasn’t there, I still doubt it would be higher than 30% right now because there is so much skepticism about it. I was going to suggest “Star Trek: Legacy”, but apparently that’s already the name of some Trek game. Anyway, it sounds like CBS have already made a firm decision about the show’s title. It’s unlikely the real title is actually “Picard”, because Patrick Stewart’s own comments imply that even the title reveals so much about a major plotline that he has to keep it a secret for now. CBS trademarked a number of Trek titles last year. One of them was “Star Trek: Revolution”. That could be a much more likely candidate, given the snippets of official info about the show’s themes that have been mentioned so far, especially the political aspects. (Unless CBS are saving that title for a show about the Eugenics Wars or something). I personally think that would be perfect. That wouldn’t make sense to a lot of people. Sounds like an Amazon service. The traditionalist in me certainly hopes the Enterprise (E, F?) would show up or at least be mentioned, Jerry. I’m pretty sure the Enterprise will factor into the show on some level. These are the same guys who brought the original back on Discovery just to show it. And as you said it would be weird not to have Picard in a show not associated with the Enterprise. Unless its a Spock or Kirk situation where he ends up in a different time or universe it would be shocking not to see the ship not part of the show even if he’s not captain of it. The question is will it be the E or a new ship altogether, the F? I’m fine with either but I have a feeling we will see a brand new Enterprise. I’m with you both. Consider that fact that Picard is one the longest living Ex Captain of an Enterprise. Archer supposedly dies two days after seeing the TOS Enterprise. April is to my knowledge not cannon. Pike and Kirk didn’t survive much longer after leaving/retiring. Harriman we don’t really know. Garret was KIA. If we follow the Countdown comic (which is seems they will) Data took command of Enterprise E at some point. Seems to be a pattern that Picard has broke. It would also seem that Picard didn’t exactly follow Capitan Kirks advice and he took himself off the bridge of the Enterprise. Heck, maybe Picard gets to use come “Colorful metaphors” that he might have picked up from Spock in Unification. I just hope they don’t pull a Luke Skywalker on him. Otherwise, this is should be a “FASCINATING” ride. Whatever they call it, i will still watch it. They should just call it Star Trek: Riker just to mess with people. For me personally When it comes To giving a title To the Star Trek Patrick Stewart show I would personally go with Star Trek destiny. Star Trek Picard Just sounds Off To me.